This make-up remover is perfectly recommended for sensitive areas of the face such as eyes and lips. It gently removes the make-up from the most stubborn make-up like waterproof mascara and leaves no oily layer. Hydrates and purifies the skin. Its convenient reverse pump simplifies its daily use. Contains organic aloe vera. 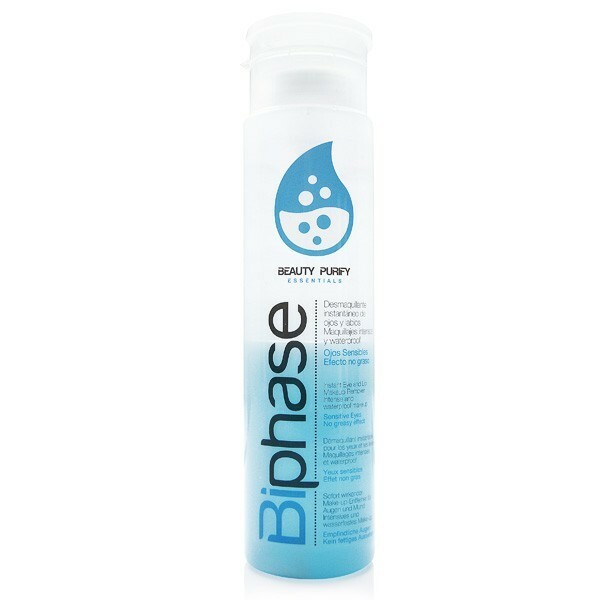 Beauty Purify Essentials Bi-phase Instant Makeup Remover is an effective makeup remover that tackles even the toughest waterproof mascara. It uses a mixture of natural ingredients to gently cleanse skin with a non-oily effect. This powerful Beauty Purify Essentials Bi-phase Remover contains soothing aloe vera, which can be used to remove makeup from eyes and lips, as well as for cleansing the entire face. Aloe vera has a cooling effect and helps to minimise puffiness and dark circles, leaving the eye area looking fresher and more awake. It is non-irritating and so is suitable for even the most sensitive skin. It also contains rosehip, which gives a moisturizing effect as it cleans. It tackles signs of dryness and dehydration, providing a hit of moisture to the under-eye area, which can often show signs of tiredness. Even though it is moisturizing, it is completely non-greasy, and leaves no residue or film.